After years of constant use outdoor play areas can start to look a little rundown. The start of the New Year or the new school year can often lead to an assessment of play areas and a desire to restore them back to their former glory. For those on a tight budget this doesn’t have to be expensive as there are lots of cost effective ways of rejuvenating play areas. Here are 5 tips for those looking for low cost ways to rejuvenate outdoor play areas. While essential repairs to equipment should be carried out on a regular basis to ensure the equipment remains safe for children to use, this is the perfect time to do non-essential repairs. For example if your safety surfacing is looking worn but has remained safe to use, consider replacing it with a new safety surfacing which will immediately have an impact on the look of the play area. As well as this, making minor repairs to equipment will help to improve its longevity and ensure it remains safe to use for many years to come. One simple and cost effective ways of rejuvenating outdoor play areas is simply tidying the area. Clearing away overgrowth will instantly make the area look bigger and cleaner, which will make it look more attractive and appealing. As well as this, clearing away any rubbish from the play area will instantly make it look more attractive. If there are plants or a grass area next to the play equipment, tidying this by pulling up weeds, cutting back plan heads and getting rid of dead plants and replacing them with new plants, grass and flowers will make a big improvement to the look of the play area. Giving fences and furniture a repaint is a great low cost way of giving play areas a makeover. The weather, along with time, can have a corrosive effect on paintwork, which can start to look worn and can make the area look shabby and unattractive. A new coat of paint, even if it is just a refresh of the same colour, will brighten the play area and make it look cleaner and more attractive. Natural wood would benefit from varnish that not only makes the wood look better but acts as a barrier that helps to keep it lasting in good condition for as long as possible. Along with repainting furniture, adding new furniture to play areas can help rejuvenate the area. Adding rubbish bins will help to keep the area clean and tidy and gives children somewhere to put their rubbish. Benches, whether fun themed versions or traditional, are a great addition to public play area as they give children somewhere to sit and rest from play, as well as parents a place to sit and relax while supervising their children playing. 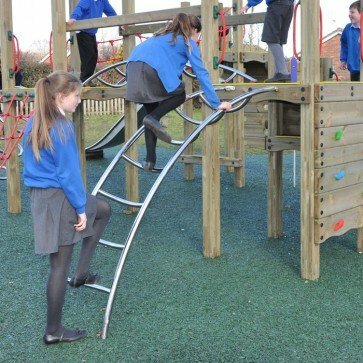 If your budget can afford it adding new equipment is a great way of refreshing play areas and making them more exciting and appealing to children. New equipment doesn’t need to be very expensive, something as simple as sand and water play for younger children or basketball hoops for older children, can be enough to make a difference to the play area. Who should repair your playground equipment?